Focusing on employment advising, Chrystina Solum is passionate about working closely with businesses to help establish sound policies and provide advice on preventative matters. She understands that by helping businesses adopt thorough employment practices from the beginning, they can focus on their mission rather than potentially deal with employee turnover or legal issues. Chrystina is an experienced litigator and available to help guide businesses when disputes arise. 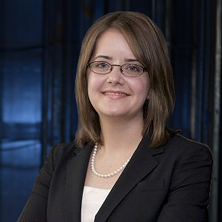 Chrystina also practices estate litigation, helping resolve disputes over a decedent’s estate. She cares deeply about protecting the rights of some of the most vulnerable members of society, the elderly. Chrystina has once again been named to the 2018 Washington Rising Stars list, her fifth consecutive year placed in the top 2.5% of attorneys in Washington State. Our resident soccer supporter, Chrystina enjoys season tickets to the Seattle Reign women’s soccer team, as well as supporting the US Women’s National Team and watching Premier League and La Liga matches.